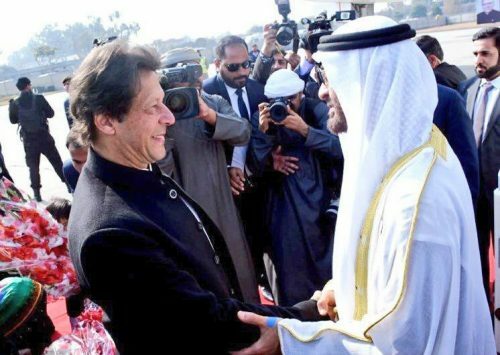 ISLAMABAD (92 News) – Pakistan and United Arab Emirates have expressed the resolve to further strengthen their historic and mutually beneficial bilateral relationship. 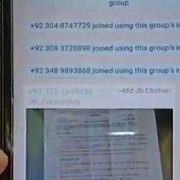 The resolve was expressed during a meeting between Prime Minister Imran Khan and Crown Prince of Abu Dhabi Sheikh Mohamed bin Zayed Al Nahyan on Sunday (today). Both the sides also discussed various regional and global issues and expressed a complete identity of views on these issues, which serves as the basis of long-lasting and trusted friendship. 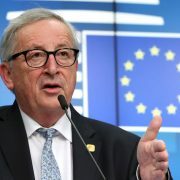 During the meeting, both the leaders agreed to take all necessary measures to deal with matters relating to trade enhancement and decided to form a Task Force to achieve the objective. 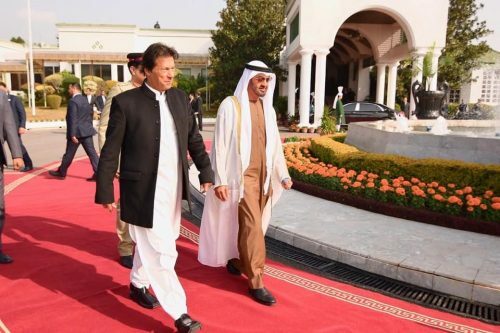 Prime Minister Imran Khan thanked the UAE for the generous Balance of Payment support of three billion dollars and said this financial support shows the UAE’s continued commitment and friendship with Pakistan. The premier also welcomed the UAE’s interest in investing in oil, gas, logistics, ports and construction sectors. Both the sides expressed satisfaction over the on-going defence and security cooperation, and vowed to further boost collaboration in the areas of training, joint exercises and defence production. They strongly condemned terrorism in all its forms and manifestations and expressed the resolve to work closely to root out this scourge. 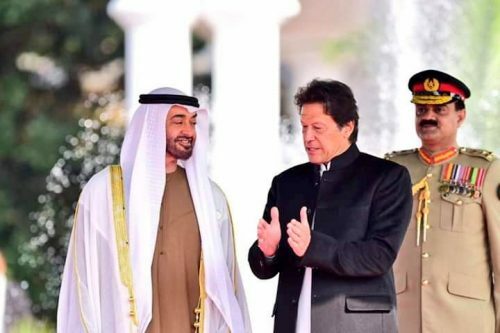 Crown Prince Sheikh Mohamed bin Zayed Al Nahyan recognized the efforts and unparalleled sacrifices made by Pakistan to eliminate terrorism and extremism. Prime Minister Imran Khan briefed the Crown Prince on the situation in Occupied Jammu and Kashmir and the plight of Kashmiris. He also briefed the UAE leader about his government’s people centric reform agenda, and the steps taken to promote transparency and accountability at all levels of government. Prime Minister Imran Khan briefed about the efforts Pakistan is making to support and facilitate the Afghan-owned and Afghan-led reconciliation process. 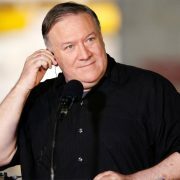 He also appreciated the role UAE is playing by hosting reconciliation talks in Abu Dhabi. The two leaders agreed to work closely for the lasting peace and stability of Afghanistan. Delegation level talks between Pakistan and United Arab Emirates held at Prime Minister’s House. 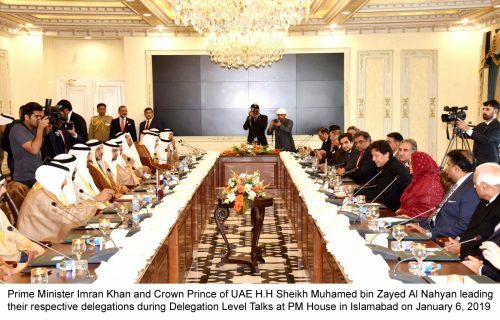 Prime Minister Imran Khan led the Pakistani delegation while the UAE side was led by Crown Prince of Abu Dhabi Sheikh Muhammad bin Zayed Al Nahyan. 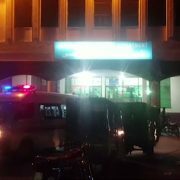 The Pakistan delegation included Foreign Minister Shah Mahmood Qureshi, Finance Minister Asad Umer, Information Minister Chaudhry Fawad Hussain, Minister of State for Interior Shehryar Khan Afridi and Foreign Secretary Tehmeena Janjua. The two sides discussed bilateral relations and matters of mutual, regional and international interests. This is the third interaction between the leadership of Pakistan and UAE in less than three months. The Crown Prince expressed his sincere appreciation for the warm welcome and hospitality extended to him and his delegation. Later, Crown Prince of Abu Dhabi Sheikh Muhammad bin Zayed Al Nahyan left for home. 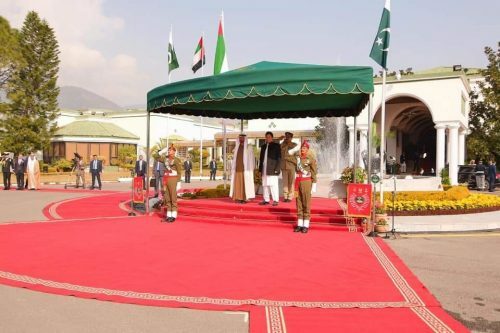 Earlier today, Abu Dhabi Crown Prince Sheikh Mohammad Bin Zayed Al Nahyan arrived in Islamabad on a day-long official visit. Sheikh Mohammed was given a red carpet welcome upon his arrival at the Nur Khan airbase. 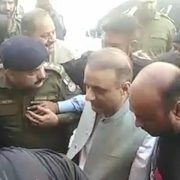 Prime Minister Imran Khan received him personally and drove him to the PM House. The Abu Dhabi crown prince was given a guard of honour and a fly-past salute during a welcome ceremony at the Prime Minister House. 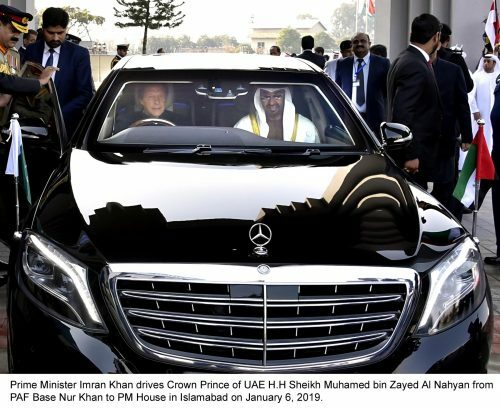 PM Khan drives the Abu Dhabi crown prince to the PM House. Federal ministers, advisers and special assistants to PM, top military leadership as well as key government officials have been invited for the luncheon organised for the visiting dignitary. Earlier in a telephonic conversation, PM Khan extended an invitation to the crown prince to visit Pakistan. 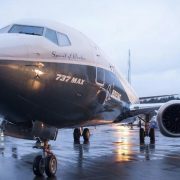 The package is expected to be announced by UAE Crown Prince Sheikh Mohammed bin Zayed Al Nahyan during his scheduled visit of Pakistan. 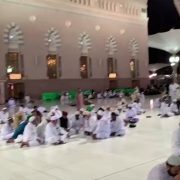 Pakistan has already received $2bn in cash from Saudi Arabia and the third installment of $1bn is due in the first week of February. 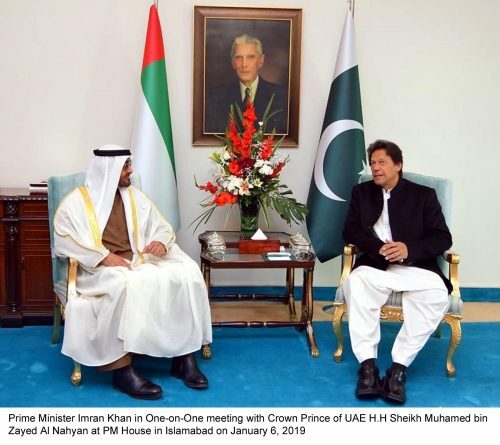 Minister for Information and Broascadsting Chaudhary Fawad Hussain has said that visit of Crown Prince of Abu Dhabi Sheikh Muhammad bin Zayed Al Nahyan will further strengthen relations between the two contries. 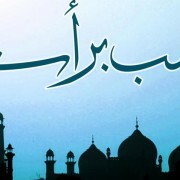 In a statement, he said the crown prince considers Pakistan as his second home. Information Minister said talks about the establishment of oil refineray has been entered in the final stage. 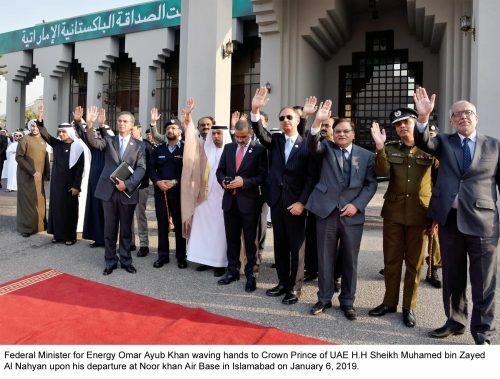 Special Assistant to Prime Minister on Media Affairs Iftikhar Durrani has thanked Crown Prince of Abu Dhabi Sheikh Muhamed bin Zayed Al Nahyan for visiting Pakistan. In a tweet , he said the world knows that we have an honest leader now and that is why the UAE leader came to Pkistan after decades to have a business with the country.